Joe Biden: I Wish I'd Spoken Up About Trump Sooner - Joe.My.God. 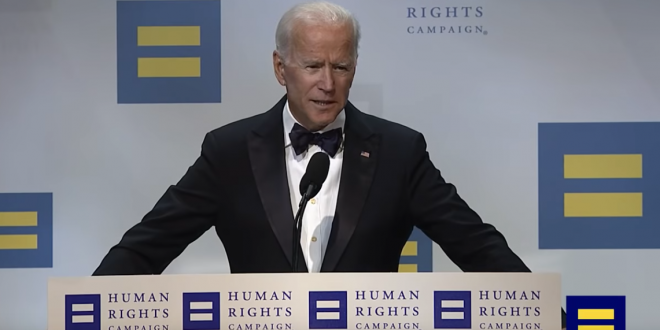 Former Vice President Joe Biden Saturday night told the audience at the Human Rights Campaign’s National Dinner that he wished he trashed President Trump sooner. “Barack and I agreed we would be quiet for the first year to let the new administration get up and running,” Biden said. “God forgive me,” he said, making the sign of the cross over his chest. Both Biden and his wife Jill, who introduced the former veep, characterized Trump as a bully. “The president uses the White House as a literal bully pulpit,” Biden said at one point. Biden appeared at the dinner as speculation heats up that he’ll run for president in 2020. He has another big event in D.C. next week for his Biden Cancer Initiative, and is also expected to campaign for Democrats through the fall.